The cast-iron Palliser Shot had been effective enough against wrought iron, but it was easily shattered by better armor. 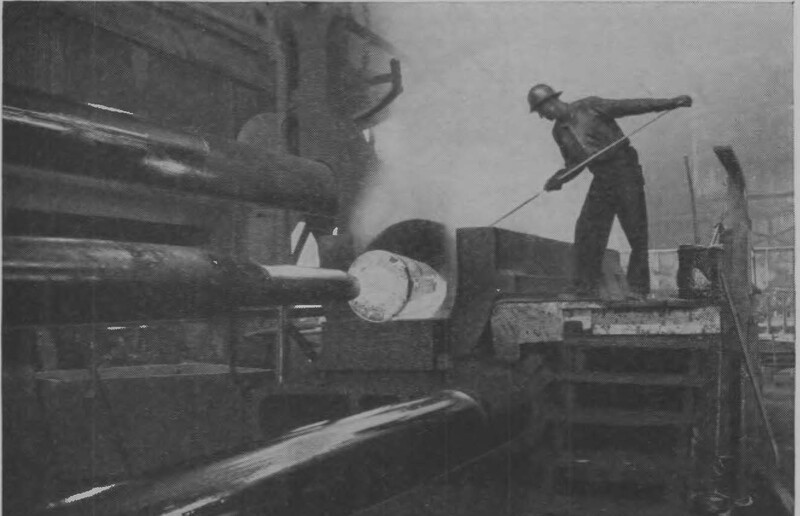 The obvious choice was to switch to steel projectiles, but the chilled hardening process didn't work with cast steel.1 In fact, cast steel was not particularly suitable for Armor-Piercing (AP) shot or shells, and projectiles had to be forged instead.2 Steel was poured into a die in the rough shape of the shell, but somewhat larger. Once the shell blank solidified, it was moved to another furnace, and then steam hammers or a hydraulic press were used to work it against a die, producing a shape close to the final shell. It was then annealed by heating in a furnace for several days to relieve any undesirable stress concentrations, and machined down to the final shape. The shell was forged with the nose closed and the base open, and after the base cavity was bored to the desired size, the opening was threaded to accept the base plug. 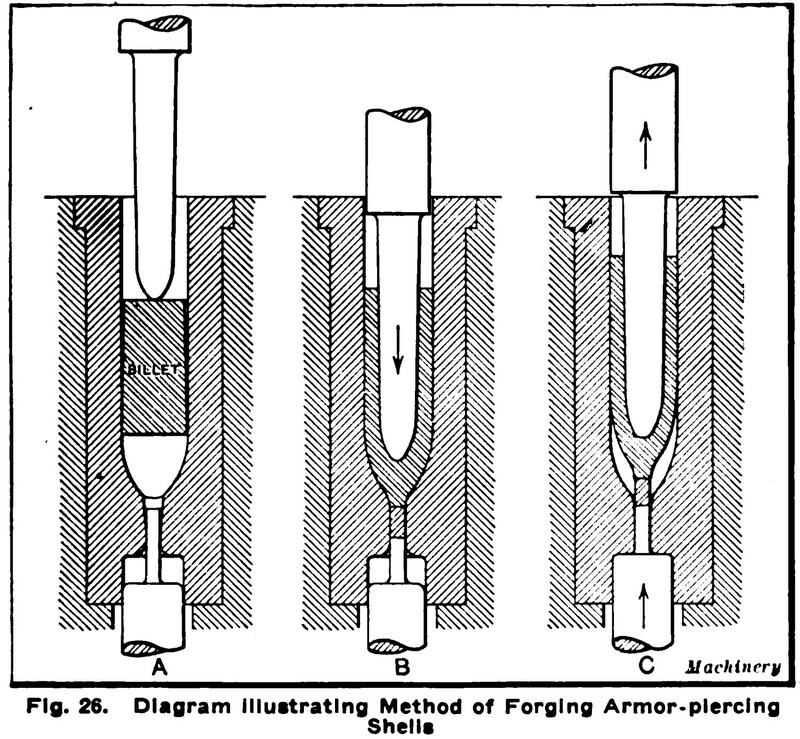 Even a forged-steel shell would usually shatter on impact with face-hardened armor, although an accident during an 1878 shell trial showed how to deal with this.5 A plate of composite armor was installed the wrong way around, and the shell penetrated easily. When it was reversed, it was discovered that a thin plate of wrought iron over the steel allowed the shell to penetrate. An officer suggested using a soft cap of wrought iron on the shell to gain the same effect, but for some reason this was ignored until the Russians tried it in 1894. 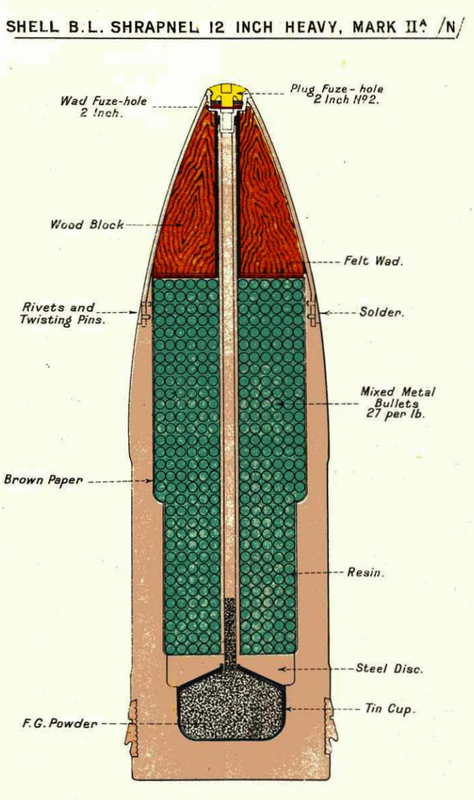 Over the next decade, most navies began to work on caps, and the resulting shells became known as APC, for Armor Piercing Capped.6 The early caps worked by essentially cushioning the shock of impact, keeping the shell's nose from being deflected or shattered by the face-hardened layer, giving approximately 15% improvement in penetration over uncapped shells, so long as obliquity was below about 15°. Above this, they would often be torn away before functioning. They were usually soldered on, using a low-temperature solder guaranteed to not change the heat treatment in the nose. A few navies had small pits in the nose which the cap was crimped into, used instead of or alongside solder. Krupp, which made most German shells, was unique in using a high-temperature solder which seems to have made its caps significantly harder to knock off during an oblique impact. 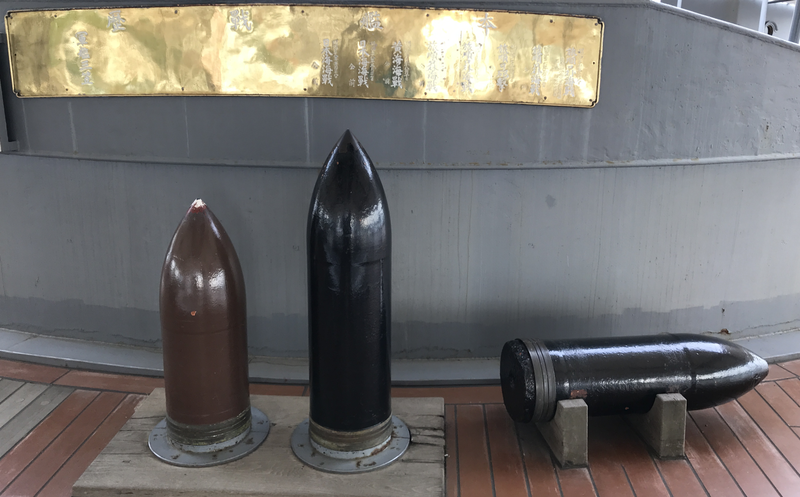 Around 1905, the capped shell looked set to revolutionize naval warfare. At the short ranges typical of the day, it could easily penetrate any belt armor a ship could practically carry. Armor was still useful against HE shells, but in practical terms, there probably wouldn't be a lot of difference between the 11" belt of Dreadnought and the 6" belt on the early battlecruisers. Over the next few years, improvements in fire control saw expected battle ranges rise quickly, to the point where even capped projectiles could be defended against, particularly due to the limitations of early caps in oblique impacts. Another important innovation during this period was the ballistic cap, also known as the windscreen, which allowed shell designers to reconcile the demands of aerodynamics with the best shape for armor penetration. Sharply-pointed shells were not particularly effective at penetrating armor, probably because the long nose tended to break under the impact, but a blunt shell would have excessive drag. The ballistic cap was nothing more than a light steel windscreen to give the shell a better shape. On impact, it would simply be destroyed, leaving the regular cap and main body of the shell to penetrate the armor. 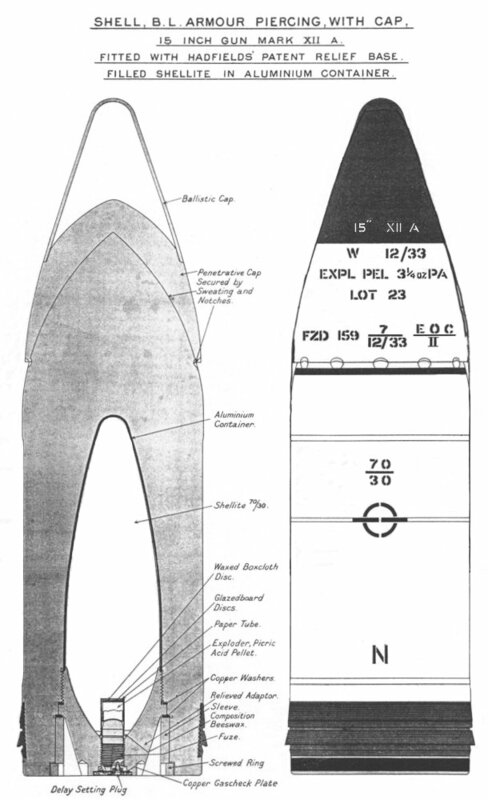 Sometimes the presence of a ballistic cap is shown in shell designations as a BC, such as APCBC, but this is far more common for terrestrial artillery projectiles, as they were nearly universal for naval AP shells. This was more or less where matters stood at the start of the First World War, although there was considerable national variation. The US fitted its battleships with only APC shells filled with dunnite, while the British planned to use a 50/50 mixture of lyddite-filled APC and powder-filled CPC, as well as some shrapnel shells for defense against torpedo craft.11 The Germans had been early pioneers in introducing TNT, which was more stable than lyddite and considerably less likely to detonate from the impact with the plate. However, it required a more complicated fuze incorporating a booster, as TNT can't bet set off by a simple detonator. This complication caused the British to stick with lyddite despite the safety hazards. The First World War would put these shells to the test, and reveal that many had glaring deficiencies in combat effectiveness. How these problems were overcome, and the longer-term development of the heavy shell, will be our topic for next time. Shells are not just simple objects; they're complicated machines that do a great deal of stuff. Hope you can eventually get around to what modern (post-1980) shell design looks like. Or is that sort of stuff still classified? That might happen at some point, although my sources on that aren't as good as they are for battleship stuff. And yes, they're very complex machines, even if they don't look it. Your comment on which materials you are familiar with leads me to ask if you have any insight into something I'm curious about. I'd been under the impression that the extremely limited use of titanium in naval applications was due to cost (especially the cost of the techniques required to work with it). Is that the whole story, or are there other ways in which titanium is unsuitable to naval applications? That's the only reason I know of. To a first approximation, naval applications are a lot more weight-insensitive than aerospace ones, to the point that it almost never makes sense to use something as expensive as titanium. Corrosion isn't likely to be a big issue, and that's the big killer at sea. There's actually a fun naval-related story from materials class. My professor wasn't good. He was a boring lecturer, structured the homework in a horrible manner, and insisted on mandatory attendence, even though it was my only class MWF that semester, and it was at 8 AM. But the most annoying this was his examples, which were usually wrong. One particularly bad week, he gave three. One was getting some details of United 232 wrong, like claiming that all the crew died, which particularly vexed me at the time, because it was so easy to look up. The other two were naval-related and more subtle. First, he said that the Soviets had adopted titanium hulls for their submarines because it was non-magnetic, and that this frustrated a deep-sea magnetic surveillance effort on the part of the US, so we then built SOSUS. I had to do a bit of research to confirm this was wrong. I think there's a second steel hull on the Soviet submarines, and magnetic detectors only work at very short range. It's particularly annoying because the Germans actually use special steel in their submarine hulls to thwart magnetic detection, which would have been a better example. The other was when he claimed that a landlocked South American country had bought battleships, and had docked them in some friendly port. They then discovered that the armored doors had suffered from creep. This was also wrong on two counts. First, no landlocked South American country ever bought battleships. Again, I double-checked this, but was able to confirm it wasn't true. Second, creep doesn't work that way in armor steel. I can testify to that personally. I remember reading that the Soviets said it would have been cheaper to build their titanium-hulled subs from gold because of the fabrication problems. It's gotten better since then, but it's still expensive. I doubt we'll see much in the surface fleet. Subs are a very different matter, where cheap enough will come much sooner.